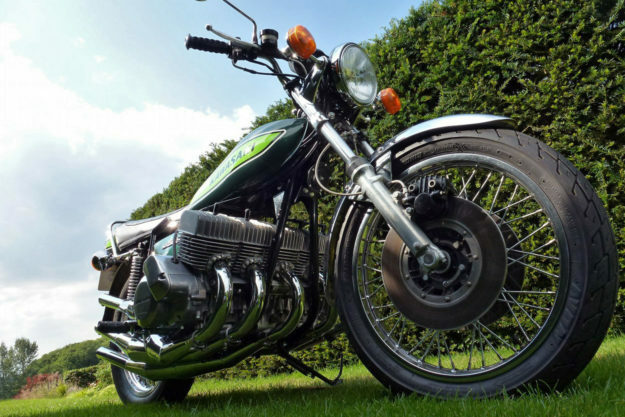 Kawasaki KH500 by Allen Millyard Allen Millyard is a special brand of engineer. He’s speed obsessed for sure, but he’s also known to sweat the design details that make a fast bike something to truly behold. His name may ring a bell thanks to the Viper V10-powered beast he built to attempt a 250 mph run, but this time around, Allen decided to chop the cylinder count in half—to a more modest five. 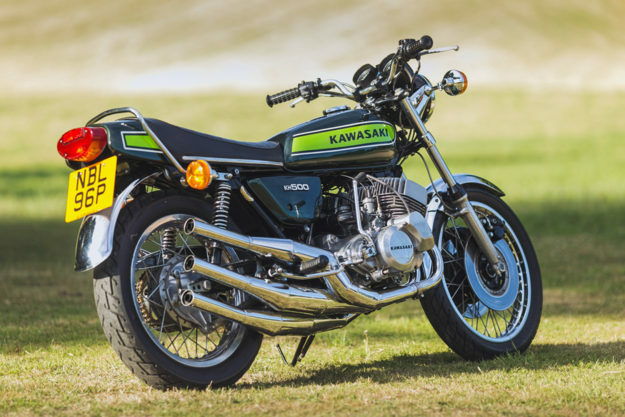 The KH500 you see here features all the terror of Kawasaki’s famed two-stroke triples with an extra pair of cylinders grafted on for good measure. That measure translates to around 109 hp at the rear wheel, and we can only imagine the struggle to keep the front wheel planted when the bees hit full buzz. 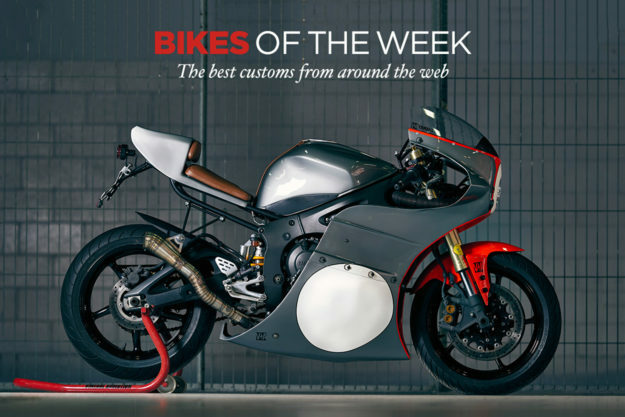 Yamaha YZF-R6 by Vintage Addiction Crew Last week we showed you what Barcelona’s Vintage Addiction Crew could do with a late model KTM EXC. That neo-retro tracker was undoubtedly cool—but this week we’ve discovered that Joe and the crew can do even better with a crotch rocket on the bench. The rocket in question is a 2005 Yamaha R6 and VA have transformed it into one of the prettiest supersports I’ve seen in a long time. As with any fully-faired bike, much of the visual credit goes to the bodywork—and this set of 70’s inspired ‘plastics’ is spot on. To ensure a snug and slim fit, the VA Crew needed to rework the R6’s subframe. The new perch hides the battery and much of the electrics, and is capped by a perforated, brown leather seat complete with matching bump stop, that matches the tank’s new strap. 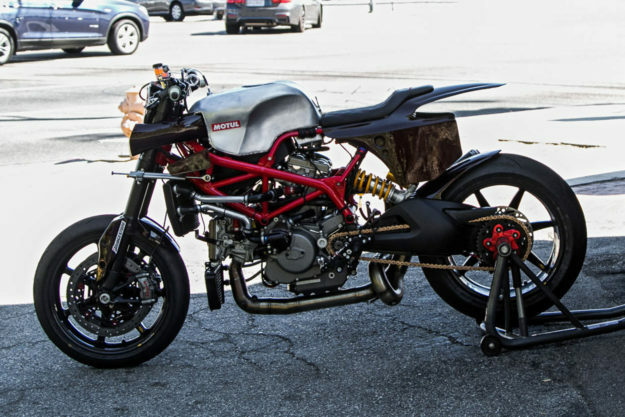 Ducati Hypermotard Pikes Peak racer by Deus It’s not often that we feature an unfinished product on these pixelated pages. 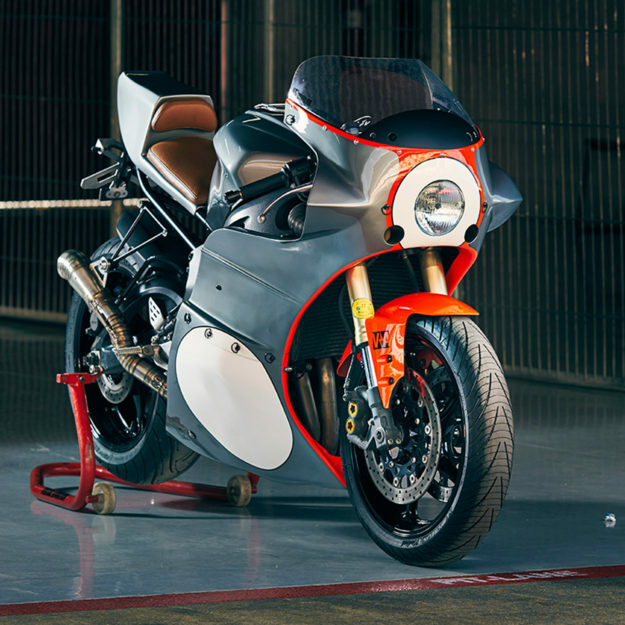 But when Michael ‘Woolie’ Woolaway decides to build a Pikes Peak racer, even the R&D is exciting. Working from a 2014 Ducati Hypermotard, Woolie has scrapped the stock, 95 hp L-Twin in favour of an 1198RS unit with 200 hp. He’s also put the SuMo on a diet. Nearly ninety pounds of excess have been trimmed from the Duc so it now tips the scales at a scant 347 pounds…wet. That translates to 1.7 lbs of machine for every pony to motivate up the mountain, which sounds just about right in our books. Yamaha XSR700 by Cafe Racer SSpirit Yamaha’s Yard Built program is one of the most exciting OEM backed initiatives we’ve come across. The sheer number and quality of builds is staggering and it’s shone a flattering light on the tuning fork brand’s lineup. And they’re simply not slowing up. 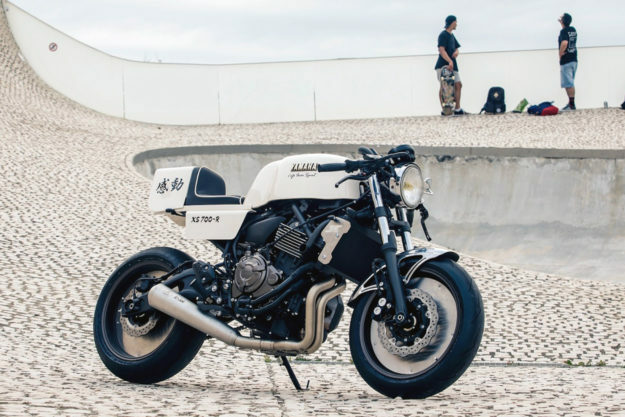 Case in point: this retro racer XSR700. Christened ‘XS700-R,’ this custom comes to us from Cafe Racer SSpirit, a group of lads based in the Basque Country near San Sebastián, Spain. It’s their twenty-fifth build, so Juan Carlos, Hugo and Juan Carlo are no strangers to adversity in the garage—but the strict parameters of the Yard Built program meant they had to shelve the grinders this time around. 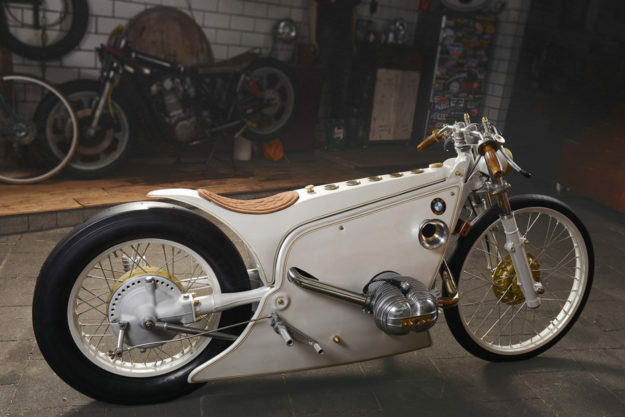 Turbocharged BMW R80 by Kingston Custom We’re pretty blessed around these parts. Our inboxes deliver some of the most exquisite examples of moto-craftsmanship on an almost daily basis. But every now and then, one comes along that redefines perfection. 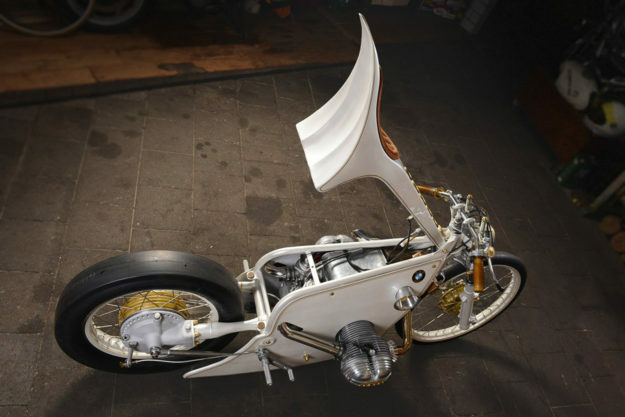 Dirk Oehlerking of Germany’s Kingston Custom has just pulled the wraps off his White Phantom and we’ve put the call into the Oxford Dictionary to revise their text. It’s hard to know where to start with this glorious creation, so I’ll try from the beginning. The donor for this project was a BMW R80 RT. I know that seems impossible, but Dirk needed the balance of the RT’s 798cc boxer to work with because that gorgeous plenum beneath the roundel on the right feeds a turbocharger. The forced induction almost doubles the airhead’s output to triple digits, which is why there’s a drag slick spooned on out back. The suspension up front has been drastically shortened and is now sprung via external coils.